Are you ready for a recipe? I would like to share one. Here is one of my favorites. So simple, and so appreciated. This one is pretty, and so delicious. It is made to give away. You’ll need 8 cups of peanuts. If you live in the Deep South, go to your local peanut warehouse and buy a 25 pound bag of raw peanuts (unbelievably inexpensive). This will get you through Christmas. Otherwise, buy two or three big cans of Virginia-type salted peanuts at your local Target or Wal-Mart. You’re going to need about 7-8 cups of nuts. Don’t obsess if you can’t find the Virginia-type large nut. Any type of peanut will work in this recipe, even dry-roasted in a jar. As long as the hard shell is off, you are fine. You can use peanuts with the red skin on if you like, and I do this all the time with my raw peanuts. Here are the ingredients. You will also need parchment paper. 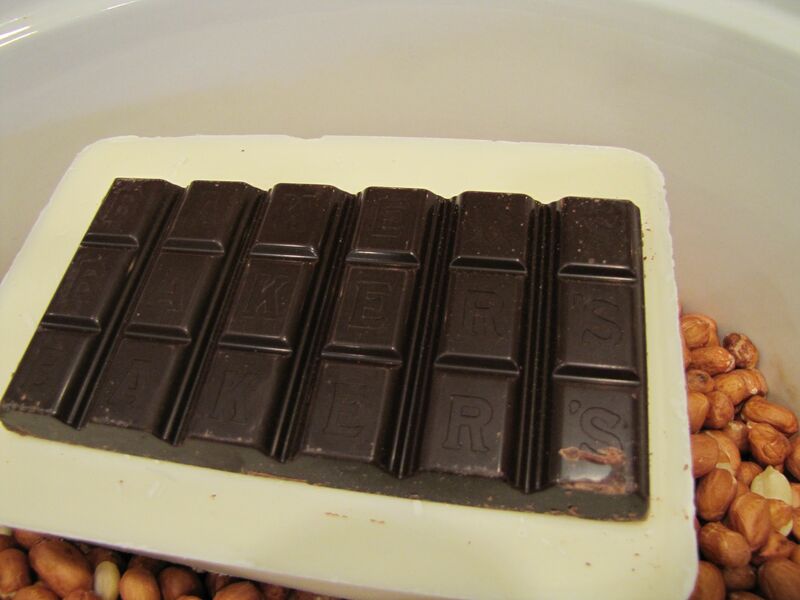 Try to layer the chocolate so that it does not touch the sides of the cooker. Don’t forget to put the top on. Cook on low for two hours in the crockpot. 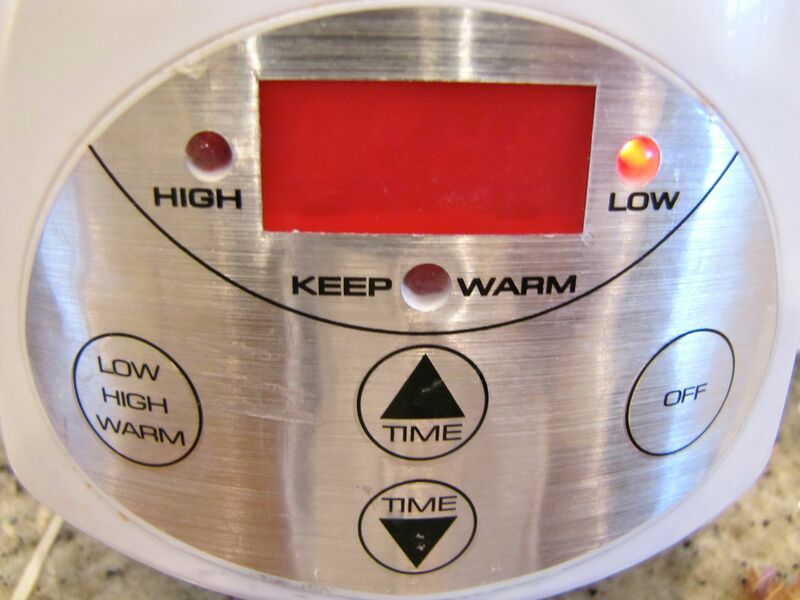 After two hours, turn off the crockpot without lifting lid. Let mixture rest for 45 minutes. After 45 minutes, stir mixture thoroughly with a sturdy wooden spoon. With a melon scoop or tablespoon, drop mixture onto parchment paper. Make sure each droplet is a little larger than the size of a silver dollar, with plenty of peanuts, say about 12 per cluster. 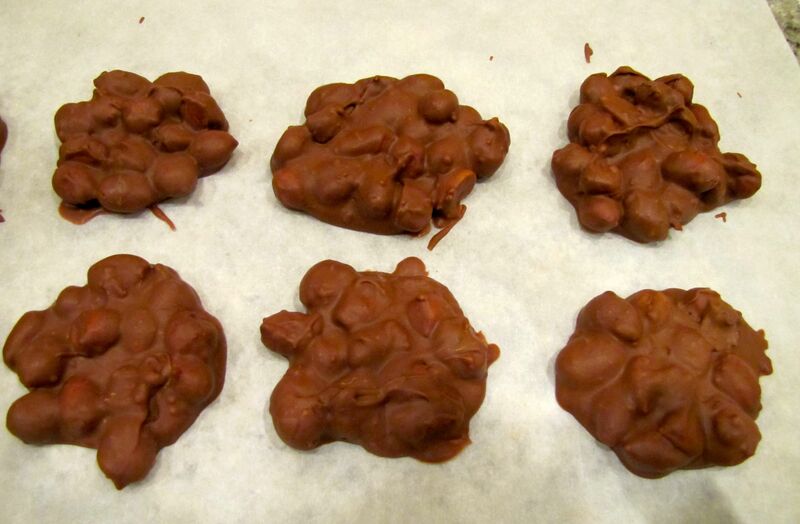 Once you have dribbled the wet chocolate on the parchment, you can spoon the peanuts on one-by-one. Keep the peanuts in one layer for best results. See photo for guidance. Yes, yours will look this good, too. 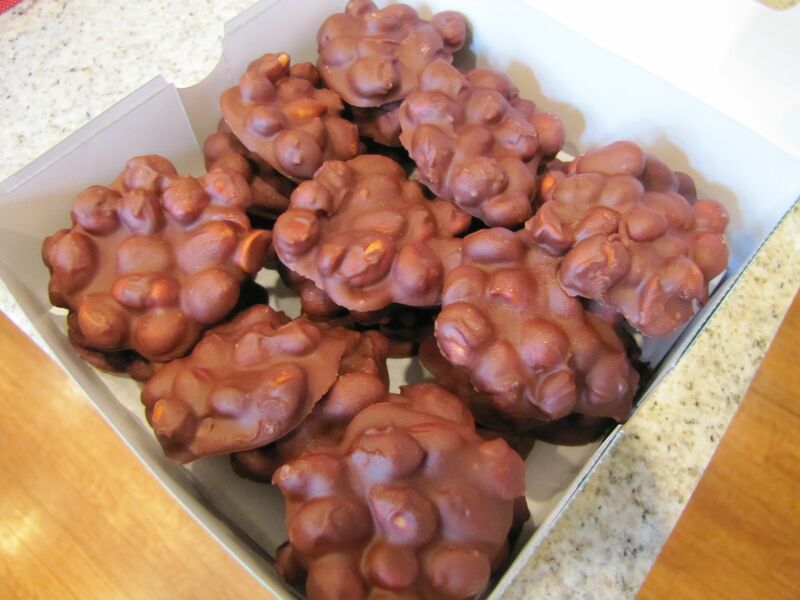 Let peanut clusters cool thoroughly. Can place the parchment on trays in the freezer to speed up process. Lift each individual cluster off parchment when completely cool. Give away immediately in cute boxes to anyone who needs to feel loved and cared for. Repeat, give away immediately. 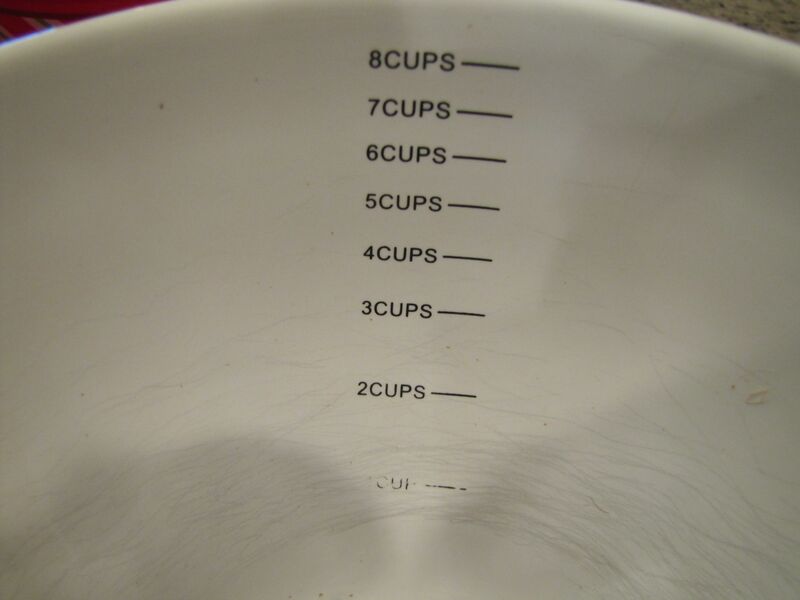 Keep recipe close by. Anyone you give this to will never let you forget how much they love this. This entry was posted on May 2, 2012 by Ellen at Color Calling. It was filed under Recipe . I was hoping for your cheese straw recipe! I love them but haven’t found a great recipe yet. 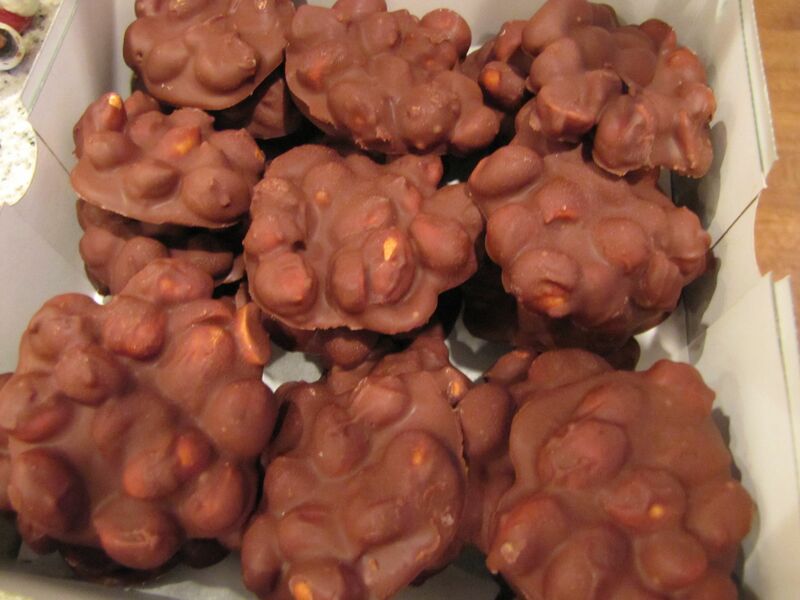 Love the sound of how you roast the peanuts and melt the chocolate in this recipe though.